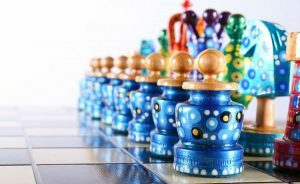 A list of high-quality chess sets with a powerful magnet that provides a fun game of chess on a small surface wherever you choose to play it. Magnetic chess sets are perfect to take on the go so you can fit in a game or two while you’re travelling. The strong magnetic bond between the board and the pieces keeps everything in place and allows you to play anywhere, whether it be on a plane or train, in a car, on a boat, or wherever else you can think of! With a magnetic chess set, you can be sure that the pieces will stay where you put them. This can be a very useful feature for a person with an unsteady hand or perhaps a young child who’s not particularly graceful. 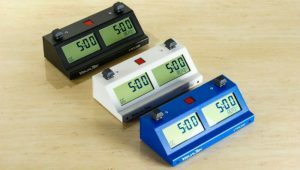 It’s also the perfect thing for chess lovers who live in relatively unstable environments, such as on a houseboat or in a full or part time RV setup. 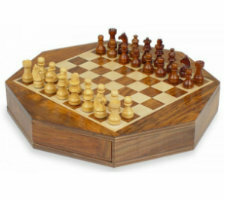 The Rosewood and Maple Folding Magnetic chess set is one of the largest in this category. 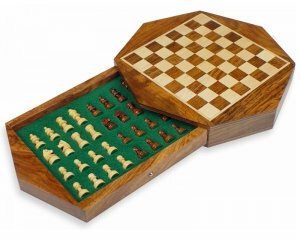 It has a nearly full sized board that is 16 inches square, along with chessmen that are up to 3 inches tall. 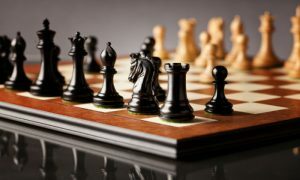 You’ll certainly have no trouble playing on The Rosewood & Maple Magnetic Chess Set without feeling cramped. Even though it provides such a large play surface, it’s still able to pack compactly because of its clever folding design. When the board is folded in half, it forms an interior storage compartment for the pieces! The felted compartments keep each piece protected until your next game. 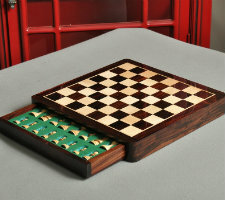 A padded leatherette case then slips over the chess board/box, keeping the playing surface protected from any scratches or other damage it may sustain in transit. In two simple steps, you go from roomy playing surface to compact package. This is also an extremely good looking set. It has a traditional, elegant style with rich woods and ornately carved chessmen. The magnets are hidden within the pieces and under their felted basepads. They may be out of sight, but that doesn’t diminish their strength in the slightest- they’re still able to easily hold the pieces in place on the chessboard when it’s flipped 90 or even 180 degrees! This is a portable set that you’d be proud to be seen playing with. In fact, it could even double as your home set without seeming out of place. This is another elegant looking set with a fairly roomy playing surface. This one measures in at an even 10 inches square, which strikes a good balance between portability and playability. It does not fold in half, so what you see is what you get. 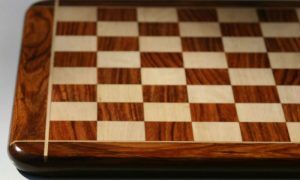 Underneath the gorgeous Indian Rosewood and Maple chess board is an interior compartment with a sliding drawer that securely stores all of the chess pieces when they’re not in use. There is a green foam insert that keeps the pieces from knocking together in the drawer. The 1 inch squares on the magnetic chess board are the perfect size to accommodate the slightly miniaturized pieces, magnets that bind the pieces to the board are exceptionally strong. The 10″ Magnetic Travel Chess Set is available from The House of Staunton for a great price, and we think it’s an incredible value for the money. Though it is small, this is a gorgeous chess set in its own right, and though it may look a bit out of place in a traditional setting due to its size, it is among the most luxurious and fancy chess sets available in this category. 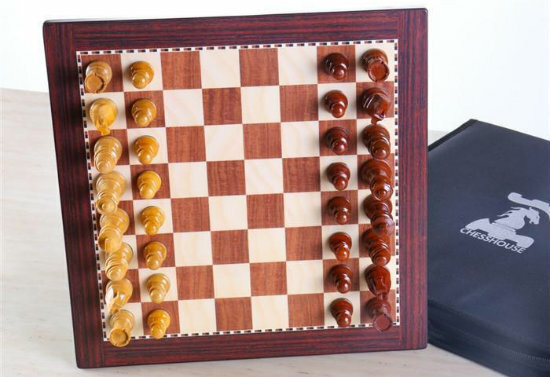 If you’re someone who prefers to travel in style, this elegant magnetic chess set will certainly help you achieve that goal. Portable chess has never looked so good! 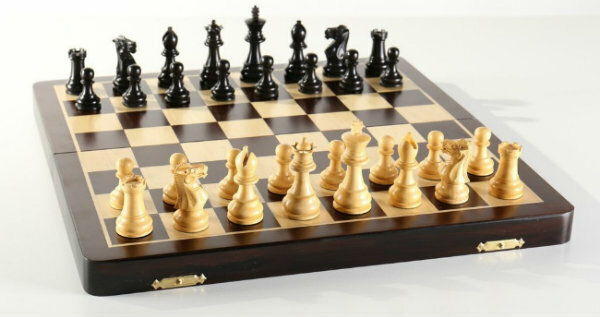 This is a highly unique magnetic chess set, mostly due to its shape. Rather than the familiar square shape many chess boards aim for, this one is octagonal! Its 8 sides may make it unnecessarily bulky without adding anything to the useable playing surface, but it sure does give this board a unique look. At only 9 inches across, this is one of the smallest magnetic chess boards on our list, but it still packs a punch even though it’s in a small package. The main thing that The 9″ Magnetic Octagonal Chess Set has going for it is its style. 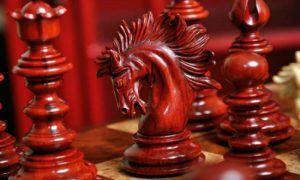 The octagonal shape of the chess board is sure to catch anyone’s eye, and the miniature chess pieces are carved with a unique vintage style that is becoming very popular right now. The squares on this magnetic chess board are less than an inch square, but they perfectly accommodate the tiny chessmen that stand only about an inch tall. The whole set is very cute. It also comes equipped with a small interior storage drawer with padded slots for each piece to be stored in while not in use. 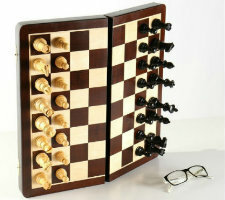 This is a highly affordable chess set that would make a great gift for the chess lover who is always on the go! This is a set that’s been thoughtfully designed with travellers in mind. It is a full set, complete with magnetic chess board, chess pieces, and a slim, zippered case to keep everything in one place. Its 12 inch size is the perfect compromise between portability and comfortable gameplay, and the chessmen are perfectly sized to fit well on this miniature chess board. Just because it’s a travel set doesn’t mean it shouldn’t look good, and luckily the makers of this set are aware of this fact because they’ve manufactured this set with handcrafted Rosewood and Boxwood as well as taking advantage of new technology to make the wood core printed board. This technology allows them to offer a durable, thin, good looking product at an affordable price. 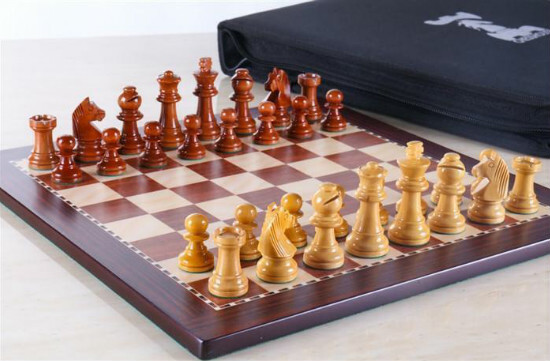 The value on The 12″ Magnetic Chess Set in Rosewood is simply amazing! 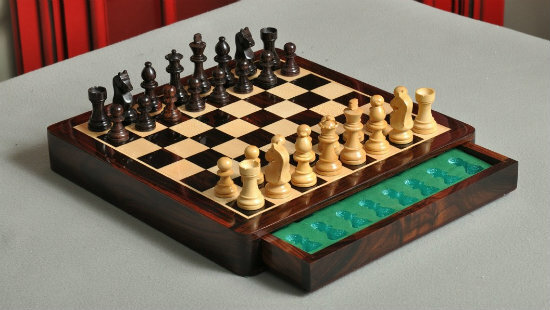 The magnets in this chess set are sufficiently strong to prevent a tilted or bumped board from turning into a disaster. Rather than flying all over the place, the pieces stay right where you put them until they’re taken off. The base of the board is also padded to protect the table or surface you’re playing on. The most unique thing about this product is the case. 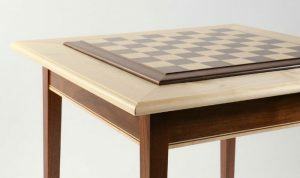 It functions as a traditional chess box, with padded storage for all of the chess pieces, but it also accommodates the chess board as well, making it an all-in-one storage solution that protects your set from damage. It is made of canvas and features the Chess House logo on its front. The best magnetic chess sets of today are both highly functional and tastefully designed. 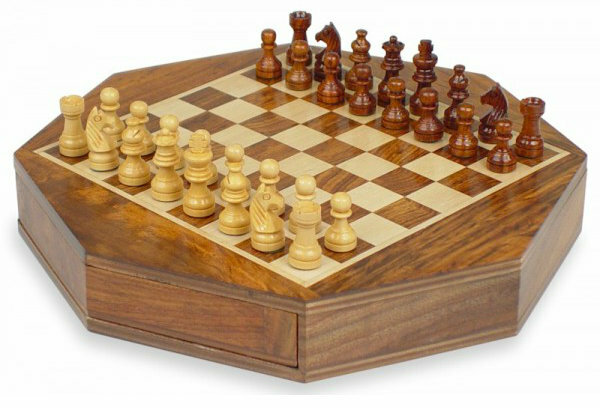 They combine the usefulness of magnetic pieces with the traditional elegance of wooden chess boards. Gone are the days when you had to choose between convenience and style. The cheap and flimsy plastic magnetic sets have given way to artfully crafted wooden sets that look every bit as good as their full sized counterparts. 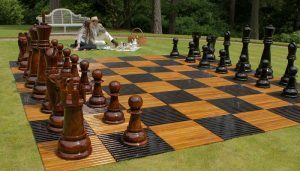 Not only has the style of magnetic travel chess boards improved over the years, but actually the function has as well. Early magnetic sets were plagued with problems, from inefficient or nonexistent storage compartments to magnets that were too weak to withstand so much as a stiff breeze. These days, all of the kinks have been ironed out, and the magnets in the boards we’ve reviewed here are more than strong enough to ensure your pieces stay put through the worst of it. You can even feel comfortable leaving in the middle of a game on, say, a cruise. When you come back, you’ll find that your pieces are still in the same place you left them, no matter how choppy the waters got while you were away. 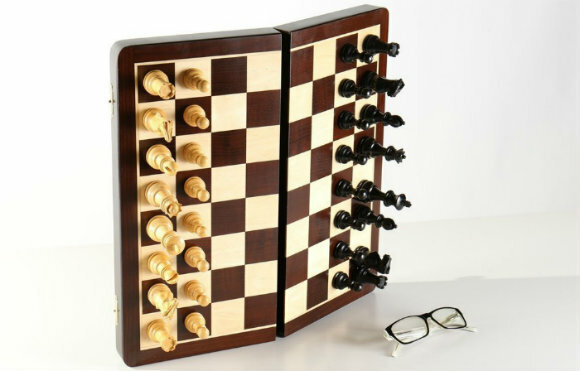 This is a unique feature of magnetic chess boards that no other category of chess set can match. With a regular set, you’d have to either play the game through and potentially miss your next engagement, give up on it entirely, or painstakingly notate the position of each piece before leaving, then double check it when you return. It’s much easier to have the chess board do all the work for you! If you couldn’t find what you’re looking for, try our Travel Chess Sets or Pocket Chess Sets pages.